The BBC are running this story about a 25lb catfish being removed from the pond at Lakeside shopping centre. It may have been picking off ducklings but if full frown ducks were being taken, I suspect there may be a bigger one present. Dunno - plenty of evidence of adult ducks being taken by pike in the 20's - would guess their moths are smaller than a cat? Alien birds (Continental Cormorants) eating our precious fish. - reaction - What is all the fuss abouit ? You could well be right re a bigger one there Ken, but I reckon even just a 25 pounder could very easily take an adult duck or any bird of similar size. Jeremy Wade (of River Monsters fame) says a fish of around 25 - 30lb is capable of grabbing & drowning a Man. Edited by Martin56, 30 March 2019 - 10:00 PM. I remember someone posted a video of Wels repeatedly ambushing and eating pigeons getting a drink. I believe, if memory serves, it was from France. In Texas I once witnessed a dead catfish with an armadillo stuck in its mouth. Both about 10 - 15 lbs I'd guess. Jeremy wade will say anything to get money for an episode ! Interests:Fishing, Golf and collecting Fishing Tackle and books. 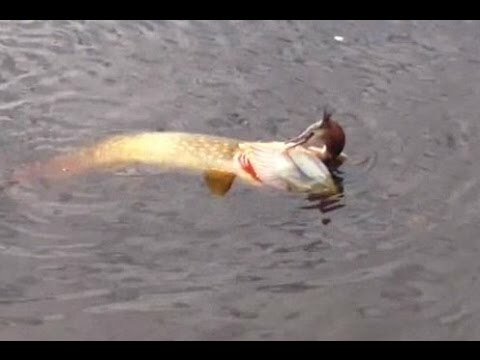 I dont know how true this is but the female bailiff of a local gravel pit near us told us about a guy who was throwing a ball out on the water for his very small dog to retrieve, and as the bailiff came around checking for day tickets the guys small dog was attacked by a big pike and was dragged under the surface. I also read in one of my Pike books about a horse that was drinking which was attacked by a Pike along the edge of a lake. They said that the Pike had homed in on the sound of the horse drinking because the Pike was probably blind. Edited by BoldBear, 16 April 2019 - 08:50 PM. Your cormerant (to me in such a small picture) looks like a grebe ? Edited by chesters1, 17 April 2019 - 07:18 AM. Good spot Chesters & looks like it's a Great Crested Grebe?? I've looked at some pictures & can only find one type of Grebe (the above) which sports a Crest.